While some of us are still struggling to ascend beyond level 20 in Pokemon Go (cough, cough, me, cough), others have reached the current summit of trainer fitness. 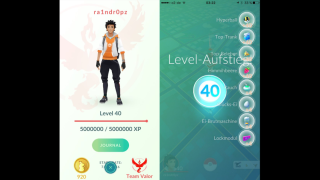 Which is to say that Pokemon Go player Luca, Reddit name _problemz, has hit the level cap of 40. What's his secret? Cheating. Luca wrote on the Pokemon Go Reddit that he does not actually play the game or intend to play - this was an experiment and a learning opportunity. This means that he did not fight in Pokemon Gyms, and in fact finds the idea of playing outside the rules in PvP to be "disrespectful and disgusting." He has also started the process of deleting his account, and will not sell or otherwise share his bot program's information. Quite the honorable hacker you are, Luca. We already knew every reward for levels 1 - 30 in Pokemon Go, but Luca's achievement shows what we can expect at the top and how much work it will take to get there. According to Luca's screenshot, you'll receive 40 Ultra Balls, 40 Max Potions, 40 Max Revives, 40 Razz Berries, 4 Incense, 4 Lucky Eggs, 4 Incubators and 4 Lure Modules. Luca also says it took a whopping five million XP to go from 39 to 40 - one-fourth of the total 20 million it takes to go from 0 to 40. Holy Magikrap! His farming also revealed that leveling up alone will not guarantee a Legendary catch, nor a Ditto or Master Ball. If these things currently exist in the game (we know they're in the code), they're not accessed through simple leveling. If you want to see what others thought of Luca's experiment or ask some questions of your own, check out the full Reddit thread. And if you're looking for some advice on how to get started on your own journey, we've got plenty of Pokemon Go tips for you. Now, someone go take Luca off his throne and really earn that world's first level 40.